As more people come to Denver, will car traffic overrun streets and neighborhoods, or will the city steer its growth to encourage more trips by transit, biking, and walking? Under the banner “Denveright,” Mayor Michael Hancock and his administration launched four new plans Thursday that could shape Denver for decades to come. Most relevant to streets and transportation are Denver’s first blueprint for intra-city transit, a master plan for a quality pedestrian network, and a land use plan to integrate development with sustainable transportation. The administration also launched a plan for city parks and recreation. The Hancock administration expects the plans to be finished between 18 months and two years from now, following an extensive public feedback process. The end result will be a set of policy priorities to improve transit, create a seamless pedestrian network, and shape development so Denver’s lightning-fast growth creates walkable neighborhoods, not car-choked streets. Of course, acting on those priorities is what matters in the end, and we’ve seen with the underfunded citywide bike plan that City Hall doesn’t necessarily follow up on implementation. But with “Denveright” the city is setting the right goals and laying the groundwork for sustainable growth. While the video makes Denveright seem light and fluffy, it’s going to be a huge undertaking if the city takes it seriously. Thursday’s launch provided some insight into the nascent plans. Here’s what we know so far. Until now, Denver’s transit network has been in the hands of the Regional Transportation District, resulting in good connections between Denver and its suburbs but lackluster service within the city itself. 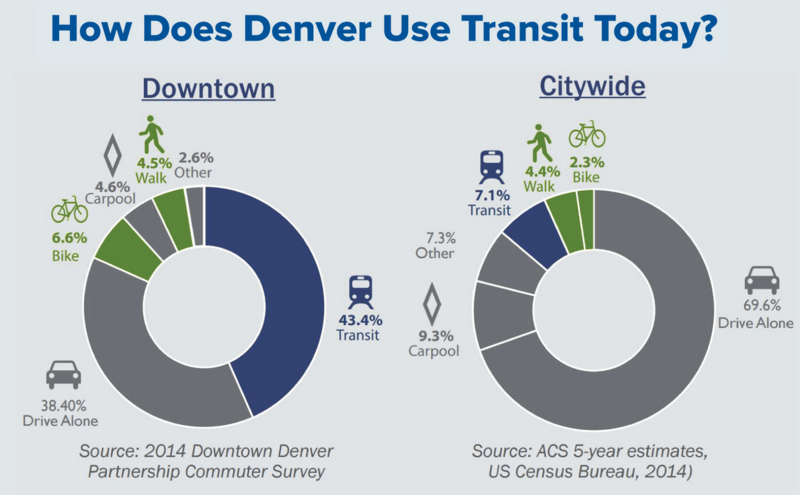 Denver’s transit needs go beyond what RTD, a regional agency, will ever realistically provide. The transit plan aims to give the city proper the attention it deserves. One inspiration for Denver’s transit overhaul could be Houston, said Jeffrey Tumlin, a transportation planner at Nelson Nygaard. There, transit planners created a much more useful network of frequent bus routes and extended weekend service — without increasing the transit budget. Ridership increased after just a few months. In 2002, Denver planners created “Blueprint Denver.” The document shaped how neighborhoods grew by establishing “areas of change” and “areas of stability.” The plan shaped a lot of the mixed-use development you see in walkable neighborhoods today — but it also led to the construction of a lot of unwalkable, car-oriented neighborhoods. Under Denveright, planners will revisit and revise the old blueprint with an eye toward concentrating development in areas with good transit service. The Denver Moves: Pedestrians & Trails plan will examine how we can make walking a viable and primary mobility choice for people to conduct their daily lives and access Denver’s outstanding recreational resources. The plan will work to improve our streets and streetscapes for pedestrians and cyclists, to connect them to Denver’s robust off-street trail network.